Until Sultan Qaboos bin Said exiled the previous Sultan in 1970, Oman was an under-developed nation, and almost completely closed to visitors. Since that time, education, public works and tourism have taken off throughout the country. Omanis are proud of both their country's rapid progress and their heritage as one of the great sea-faring nations. Excellent schools and hospitals, good governance, and on-going infrastructure improvement are all important characteristics of this once introverted and closed nation. The oldest known human settlement in Oman dates to the Stone Age. Sumerian tablets refer to a country called Magan, a name thought to refer to Oman’s ancient copper mines. The present-day name of the country is believed to originate from the Arab tribes who migrated to its territory from the Uman region of Yemen. Many tribes settled in Oman making a living by fishing, herding or stock breeding and some present day Omani families are able to trace their ancestral roots to other parts of Arabia. From the 6th century BC to the arrival of Islam in the 7th century AD, Oman was controlled and/or influenced by three Persian dynasties, the Achaemenids, Parthians and Sassanids. By about 250BCE, the Parthian dynasty brought the Persian Gulf under their control and extended their influence as far as Oman and established garrisons in Oman. In the third century CE, the Sasanids succeeded the Parthians and held the area until the rise of Islam four centuries later. Oman has one of the hottest and driest climates in the world. However, there are substantial differences between the coastal zone, the mountain regions, the arid inland desert and the southwestern region of Dhofar. Summer day temperatures on the coast can easily exceed 40°C (104°F). Coupled to night temperatures of 30°C (88°F) or more and relatively high humidity, this makes going outside very unpleasant. In the Omani desert, Summer daytime temperatures of over 50°C (122°F) have been reported. Winter is much more pleasant with daytime temperatures generally between 25 and 30°C, and is therefore the preferred period of travel. Rainfall is less than 100 mm (3.9 in) per year, mainly falling in Winter in the form of very heavy and prolonged thunderstorms. These can lead to dangerous flashfloods in the lower reaches of the usually dry river beds. In the mountain areas, temperatures are milder with more rainfall. In the higher reaches (over 2000 m), snowfall is even possible in Winter, though this will never last for more than a single day. The Dhofar region has a different climate with monsoon rains between late June and late September. Summer temperatures are much more pleasant there. Because of its hot climate, sea water temperatures are high all year round. Hajar Mountains - a majestic range, the highest in the Arabian Peninsula, which stretches into the United Arab Emirates. Entry will be refused to citizens of Israel. Israeli stamps are not a problem for entry. Citizens of Bahrain, Kuwait, Qatar, Saudi Arabia and the United Arab Emirates do not require a visa to visit Oman, and may use National ID Cards to enter the country. Those who hold a visa or entrance stamp of the Emirate of Dubai that is valid for at least 21 days are visa exempt. Similarly, those who hold a visa for Qatar that is valid for travel to Oman and valid for at least one month, and who are nationals of visa on arrival eligible countries, are visa exempt when arriving directly from Qatar. Citizens of New Zealand may obtain a visa on arrival valid for 3 months, which is extendable once for a fee. Citizens of the European Union, Andorra, Argentina, Australia, Bolivia, Brazil, Brunei, Canada, Chile, Colombia, Ecuador, Hong Kong, Iceland, Indonesia, Japan, Lebanon, Liechtenstein, Macau, Macedonia, Malaysia, Moldova, Monaco, Norway, Paraguay, San Marino, Seychelles, Singapore, South Africa, South Korea, Suriname, Taiwan, Thailand, Turkey, United States, Uruguay, Vatican City and Venezuela may obtain a visa on arrival valid for 30 days, which is extendable once for a fee. Starting March 21st 2018, it will not be possible to receive a visa on arrival, one must apply for a visa online . The fee is OMR20 and your passport should be valid for no less than 6 months from the date of arrival. However, if you arrived by air into Dubai International Airport and subsequently enter Oman via land, the visa fee will be waived (this does not seem to be true any more as of 2014: even when you enter from Dubai by bus at the Al-Wajaja border post, you’ll have to pay the fee!) Any visa fees can be paid using UAE dirhams at a rate of AED10 to OMR1. At the airports, visa fees can be paid in any Gulf States Co-operation Council (GCC) currency, euros, and US dollars. NOTE: Crossing the border by car from the United Arab Emirates into Musandam Peninsula via Ras Al Khaymah, the visa-on-arrival fee was OMR5 (as of April 2016). However, the border official stated this was only valid for 1 week. Chinese, Russian and Ukrainian nationals may obtain visit visas following the same procedures provided that they are part of tourists groups arriving to the Sultanate through a local tourist agent or a hotel or as a family. In the case of groups, the number of females must not exceed the number of males. The visa can be extended another month by submitting your passport to the Royal Omani Police in Muscat, however there is one line, and the wait can be as long as 2 hours. Be aware that the concept of personal distance is different in the Middle East than it is in Europe. Line jumping may be a problem for Europeans unless you set aside that personal distance concept. Note that you can also extend your visa (usually without long waits) in the departure hall of Muscat Airport, opposite Costa Coffee – you must pay the fee with a credit card! If you are on a budget and need to extend your visa, take a trip to the United Arab Emirates. Buses are OMR10-12 return. A same-day round trip flight to Sharjah on Air Arabia costs about OMR50. Even a taxi would be an option. It is prohibited to bring firearms, narcotics or pornographic publications into Oman. Non-Muslims are permitted to bring two litres of alcohol into the country at Seeb International Airport only. You are not allowed to bring alcohol into the country in private cars at land border crossings. Virtually all international flights arrive at Muscat International Airport (MCT) in Muscat. There are also a small number of regional international flights to Salalah (SLL). Purchasing a visa on arrival in Salalah can be quite difficult, as the airport is very small and immigration officials tend not to have change for larger notes. There are also direct flights from various Indian cities by airlines like Air India, Indigo and Spicejet. The port in Muscat is used by cruise ships, however there are no regular passenger services to Oman. This is slowly changing, with more cruise ships (generally smaller ones) making port calls. Ferries provide important links between ports in Oman and the region, with the National Ferries Company (NFC) providing a high speed, first class service. Main routes include ferries from Shannah to Masirah and Muscat to Khasab. Cars are able to be transported on selected routes. Khatmat Milahah from Kalba, (Is a Part of Sharjah Emirate) is 5kms from Fujairah Town. from Fujeirah emirate to Dibba/Musadam. Driving directions and border crossing from Abu Dhabi to Muscat- For Abu Dhabi residents crossing to Oman, there are 3 border posts in Al Ain - Buraimi Border post (reserved exclusively for GCC residents), Hilli Border post and Khatam Al Shukla border posts (serving expatriates). Roads are excellent and the border crossing is quite easy. Don't forget to bring along some cash as you have to pay for the visa to enter Oman. If you are taking a car from the UAE into Oman you will need to produce evidence at the border that the car is insured in Oman. And returning through Al Ain border is free of charge in both borders. Additionally, make sure that your passport is stamped with the relevant entry and exit stamps. This should go without saying, but some border officials will forget part of the procedure and cause administrative hassles later. Additionally, crossing from Oman to the UAE is often a chaotic business, so it is easier to miss out on the all-important stamp than one might expect. 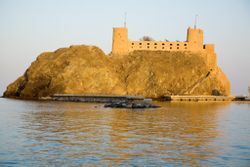 Crossing from Oman to Yemen is significantly more challenging, and those of an adventurous bent should familiarise themselves very carefully with the regulations regarding that border. In previous years, there has been a law that no solo female travellers can exit Oman to Yemen. Additionally, bear in mind that the easternmost parts of Yemen are exceptionally remote. While a border (unmarked) exists between Oman and Saudi Arabia, this is a very inadvisable crossing, as it involves going through most (if not all) of the Empty Quarter and there are no permanent roads. There are regular buses between Muscat and Dubai (UAE). There are private operators as well as the state-owned Oman National Transport Company (ONTC), and the ride (which usually takes 4-5 h) is usually quite comfortable. Note that when passing the border to Oman, in many cases passengers must line up all of their luggage in a long line, which is subsequently scrutinized by a police dog sniffing for any forbidden substances. Oman Air is the national carrier and flies regularly between the two airports in the country (Muscat/Seeb, and Salalah). Air Arabia now offers flights to Salalah and Muscat from the United Arab Emirates (UAE). 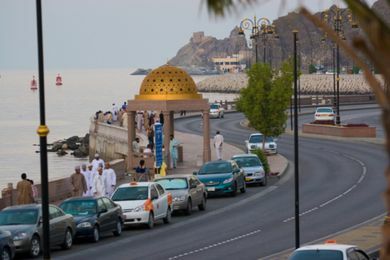 There are regular, daily bus services connecting the bigger cities within Oman (Muscat, Salalah, Sohar, Sur and Nizwa). There are several, daily bus services from Muscat to Dubai. There is one bus a day from Muscat to Abu Dhabi. For details see the pages of th National Transport Company. All taxi drivers in Oman are Omani nationals as this is a protected profession. In Muscat there are call/telephone Taxi services. Whilst safe and generally turn up when you want them to the costs are comparatively high. Look for "Hello Taxi" and "Muscat Taxi" amongst others. The orange-badged taxis are usually owner-operated, these are unmetered with negotiated fares before departure. If you get a very cheap price, then do not be surprised if the Taxi stops to add extra passengers unless you request for it to be private. You may ask for engaged, just say 'engaged taxi' to the driver, and you will pay for all the seats (4) and now have the taxi to yourself. Women must always sit alone in the back. There are also mini-buses (Baisa buses), the principle is you share the bus or car with others and pay a lower price as a result. This is how women living in Oman travel if they must use public transport. Women should sit next to other women if there are any in the bus. Men should move to other seats. If they do not move immediately, simply stand at the door, looking at them expectantly. They will take the hint and move. Although this might feel strange to foreigners, it is expected behaviour for Omanis. Not sitting next to a man will avoid any unfortunate situations of mixed signals. Believe it or not, but it's actually illegal to drive around in a dirty car in Oman. You may get stopped by the police who can fine you OMR10, although they are more likely to just tell you to wash your ride. Driving around Oman in your own (rented) car is quite easy. A four-lane road connects Muscat and Nizwa and a recently constructed four-lane highway goes from Muscat to Sur. There are still large parts of the Sur - Muscat route that has no mobile phone signal. If you break down be prepared to wait it out. Or hitch a ride to the next town and find a mechanic to bring back to your vehicle. Lovely seaside camping can be found between Muscat and Sur. 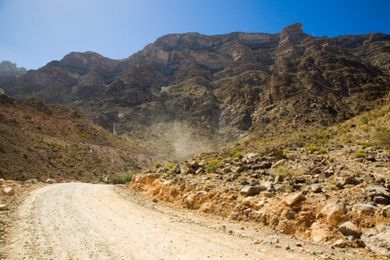 Best to take the paved route to SUR, then over to Wadi Shab to find your way safely into this coastal road. If you intend to drive in wadis (unsealed valley roads in river beds) a 4x4 is highly desirable. You can never be sure how the road will be and if it starts raining the wadis will turn into rivers quickly. If at all possible, hire a 4 wheel drive. There is spectacular off-road driving to be had in Oman, and you will want to veer off the tarmac again and again. Since about 2001 Oman has been experiencing severe flash flooding annually. The force of the water rushing down the rock hard treeless mountains do push even landcruisers off the road and upside down. Beware. If you see dark clouds or rain starts. Find high dry ground, shelter and stay put. You can put a call into the local authorities to see if they can advise you better. The problem is the flash floods move quickly from town to town, it is easy to get trapped by washed out roads. Many wadi crossings have white and red poles to indicate when it is safe to cross the wadi in case of a flood. These are painted white on the bottom and red on top. If the water level reaches the red-painted part, do not attempt to cross, even in a 4x4. If you managed to get a map of Oman regard it as how Oman would like to have the roads. Some roads might be drawn as well-built streets but are not even paved. Roads not being visible on the map might just end and may even be painted till the end! Other roads may be very steep and require you to engage low gear, especially when going downhill. Distances in Oman are relatively long. The problem is the limit of kilometres of the typical rented car of 200-250km per day. Prepare to pay and negotiate for extra kilometres. Monthly rates sometimes include unlimited kilometres. Petrol in Oman is very cheap by European and even North American standards. Up until January 2016, the price for regular petrol was approximately OMR0.114 per litre for regular. Since then, the government has removed petrol subsidies, and a litre of regular petrol will set you back OMR0.145 (April, 2016). Since 2006, in order to try and limit the rather frightening road death toll, the motorways/dual carriageways are littered with speed cameras. In the centre of Muscat they are every 2 km, not all look like they are active - but be warned. According to locals, the tolerance on the speed cameras is 15 km/h. Arabic is the national language, but most Omanis will speak good to excellent English, particularly in major tourist areas and cities. In the southern Zufar (Dhofar) region, an indigenous Semitic language called Jibbali is spoken, while the related Mehri language and other rarer languages are also found elsewhere in the country. Balochi is spoken by the long-established Baloch minority, especially in the capital, Muscat. Swahili is also spoken by thousands of returnees from Zanzibar and other parts of East Africa. There are also very many recent immigrants and temporary workers from Eastern Africa who speak Swahili. Oman has a very long-standing maritime and trade tradition with the "Swahili Coast" of present day Kenya, Tanzania, Unguja, Pemba, Comoros Northern Mozambique and Southern Somalia) and in 1832 the Omani ruler Said bin Sultan moved his headquarters from Muscat to Stone Town, Zanzibar. His progeny were to rule the islands and part of the mainland Coast until their violent overthrow by Africans in 1964. In recent years, relations have been restored and there is lots of traffic both ways which has only grown to increase the usage of the Swahili language. The presence of large numbers of expatriates from the Indian state of Kerala has made Malayalam a prominent language, while the historical presence of other Indian traders has meant that Hindi is understood in some urban areas. A significant number of residents also speak Urdu, due to the influx of Pakistani migrants during the late 1980s and 1990s. An English-speaking traveller should have no language difficulties unless really off the beaten track. Oman's beaches are major breeding locations for various species of sea turtle. Masirah Island is the perhaps best bet where four species breed, including the largest number of leatherbacks anywhere in the world. The country can boast not only vast expanses of desert, and hundreds of miles of uninhabited coastline, but also mountains of over 9000 feet. The currency in Muscat is the Omani rial (OMR). One rial is made of 1000 baisa and is officially tied at 2.58 US dollars per 1 Omani rial making the Omani rial one of the most valuable currencies on the planet. Exchange rates on the streets are 1-2% lower. There are ATMs at the airport and many other in Muscat and every main town, but not all of them take foreign cards. You can change foreign currency at the counters inside the airport and at money exchanges throughout Oman. The Omani national symbol is the silver-sheathed dagger known as the khanjar. These vary widely in quality and cost, but almost every shop will stock several different models. Most of the modern ones are made by Indian or Pakistani craftsmen under Omani direction, while many are actually made in India or Pakistan. There is a large variety in quality, from the handles to the sheath. The best handles are made of silver-adorned sandlewood, while the lesser quality handles are made of resin. Look carefully at the sheath to determine the quality of the silver work. A good quality khanjar can cost upwards of OMR700. Typically, those will come in a presentation box, and include a belt. Another reminder of the country's tribal past is the walking stick known as arsaa. This is a cane with a concealed sword in it, which can prove quite a talking point at home. Unfortunately, in many countries, it will prove a talking point with customs officials rather than friends and family. In Musandam, the khanjar is frequently replaced by the Jerz as formal wear, a walking stick with a small axe head as the handle. Omani silver is also a popular souvenir, often made into rosewater shakers and small "Nizwa boxes" (named for the town from which they first came). Silver "message holders" (known as hurz, or herz), often referred to in souks as "old time fax machines" are often for sale as well. Many silver products will be stamped with "Oman" on them, which is a guarantee of authenticity. Only new silver items may be so stamped. There is a large quantity of 'old' silver available which will not be stamped. Although it may be authentic, stamping it would destroy its antique value. Caveat Emptor are the watch words. Stick to reputable shops if you are contemplating buying antique Omani silver of any sort. There is a wonderful selection of Omani silver available as jewellery as well. Items for sale in the Muttrah souk may not be genuine Omani items. Instead visit Shatti Al Qurm just outside of Muscat or the Nizwa Fort. The distinctive hats worn by Omani men, called "kuma" , are also commonly sold, particularly in the Muttrah Souk in Muscat. Genuine kumas cost from 80 OMR. Frankincense is a popular purchase in the Dhofar region as the region has historically been a centre for production of this item. Myrrh can also be purchased quite cheaply in Oman. As one might expect, Oman also sells many perfumes made from a great number of traditional ingredients. Indeed, the most expensive perfume in the world (Amouage) is made in Oman from frankincense and other ingredients, and costs around OMR50. You can also find sandalwood, myrrh and jasmine perfumes. Opening hours during the holy month of Ramadan are very restricted. Supermarkets are less strict, but don't rely on being able to buy anything after iftar. At noon, most shops are closed anyway but this is not specific to Ramadan. Using credit cards in shops is hit or miss. It is better to get cash at an ATM. Small denomination notes are hard to come by but necessary for bargaining. Unless you are in a supermarket, restaurant or mall bargaining is recommended, and this should be conducted politely. The food is mainly Arabic, East African, Lebanese, Turkish, and Indian. Many Omanis make a distinction between "Arabic" food and "Omani" food, with the former being the description of the standard dishes found throughout the Arabian Peninsula. Omani food tends to be less spicy and served in quite large portions - whole fish are not uncommon at lunch in some local restaurants (sticking to local food, it is quite easy to eat a substantial meal for less than OMR2). As befits a country with a long coastline, seafood is quite a common dish, particularly shark, which is surprisingly tasty. True traditional Omani food is hard to find in restaurants. Omani sweets are well-known throughout the region, with the most popular being "halwa". This is a hot, semi-solid substance which behaves a little like honey and is eaten with a spoon. The taste is similar to Turkish Delight. Omani dates are among the best in the world and can be found at every social place and at offices. American fast food chains, especially KFC, McDonalds, and Burger King, are not hard to find in the bigger cities, especially Muscat and Salalah. In Khaboora you can get Pakistani Porotta. They are double the size of Indian Porottas and look like pappadams. But they taste like porottas and are much thinner and delicious. Three porottas are available for the equivalent of Rs11. Traditional Omani Khubz (bread) is hard to find outside of an Omani home, but for an experience one should try hard not to miss. This traditional bread is made of flour, salt and water cooked over a fire (or gas stove) on a large metal plate. The bread is paper-thin and crispy. It is eaten with almost any Omani food, including hot milk or chai (tea) for breakfast-- "Omani cornflakes". In Sohar you may get an excellent lunch with Ayla curry, Ayla fry and Payarupperi. Expect to pay only 400 baisa (OMR0.40) which is considered a very low lunch price here. A good bet for budget travellers are the many 'coffee shops' which are usually run by people from the Indian sub-continent and sell a mixture of Pakistani/Indian and Arabic food, dishes mostly cost one rial or less, especially 'sandwiches' which can be around 200 or 300 baisa. They usually sell falafel, which is a good and cheap vegetarian option. Their actual coffee is often uninspiring Nescafe but their tea reflects their sub-continental management in being masala chai. Food & Hospitality Oman is an annual international exhibition that focuses on Oman’s food and hospitality industry. It showcases food and beverage, hotel equipment and supplies, kitchen and catering equipment, food packaging products, and food processing technologies, and other related products and services. The legal drinking and purchasing age of alcoholic beverages is 21. Bottled drinking (mineral) water is easily available at most stores. Tap water is generally safe; however, most Omanis drink bottled water and to be safe, you should too. Alcohol is available only in select restaurants and large hotels and is usually very expensive (ranging from OMR1.5 for a 500mL Carlsberg to 4 rials). Drinking alcohol in public is prohibited, but you can get your own drinks and enjoy at public areas but in privacy such as camping by beaches, sands, mountains, or actually in any remote areas. Only foreign residents can buy alcohol from alcohol shops and with certain limits. Residents need personal liquor licenses to consume alcohol in their private residence(s). But an alcohol black market is widely spread around the cities and alcohol can be found easily. Foreigner travellers are allowed 2 litres of spirits as duty free baggage allowance. Travellers can pick up spirits at the duty free shop in the arrival lounge. During Ramadan, drinking anything in public is prohibited during daytime (i.e., sunrise to sunset), even for foreigners. Take care to drink in the privacy of your room. Oman has the full spectrum of accommodation - from ultra-luxurious hotels to extremely rustic huts in the desert constructed from date palm leaves. In recent years, Oman has been attempting to turn itself into something of a five-star destination for well-heeled travellers. This does not pose a problem to the budget-minded in Muscat, and even outside of the capital there is still a range of budget options. In some parts of the country, however, accommodation may be limited to higher-end hotels and resorts. Camping is allowed pretty much anywhere, and it is generally easy to find a spot to pitch a tent once outside of big cities. Small dirt tracks constantly branch off from main roads, and following those for a few minutes usually leads to a good spot. Camping in wadis is also possible, but can be dangerous in case of rain (when the wadi turns into a river). Working in Oman requires that you hold a residence permit. In common with other Persian Gulf countries, you must be sponsored by an employer to obtain a residence permit. It's not uncommon for people to enter on a tourist visa then look for a job - this is fine. Penalties for the employer are substantial if they are caught employing illegals, although this naturally varies depending on how good their connections are. The majority of positions are filled by expats from the sub-continent. Positions for Europeans tend to be restricted to upper management levels or specialised occupations, so don't expect to pick up a position as you pass through unless you are prepared to work for very little! Visitors may be interested in the monthly English language lifestyle magazine, Oman Today, which is widely available in Oman. Oman is a relatively safe country and serious crime is rare. The Royal Oman Police is notably efficient and honest. Driving in Muscat can sometimes be a problem, although this is due more to congestion than bad driving on the part of the locals. Outside of the major cities, a common driving risk is falling asleep at the wheel due to the long stretches of featureless desert. Driving in Oman calls for attention to the unexpected. It has the second highest death rate from traffic accidents in the world (surpassed only by Saudi, followed closely by the UAE). Omani drivers outside of the cities tend to drive very fast and pass with impunity. Driving at night is especially hazardous as many drivers fail to turn their headlights on. Camels will walk into the road even if they see cars approaching, and collisions are often fatal for both camel and driver. As with most other Islamic countries, prostitution is illegal. Oman isn't as severe as neighbouring Saudi Arabia with the LGBT community, but the Omani government doesn't condone any form of LGBT activity. Punishments include fines, and up to 3 years in prison. Oman is warm year-round and summers can be extremely hot. Always carry drinking water with you and be wary of dehydration in high temperatures. If you're not used to the heat it can sneak up on you and cause serious health problems. 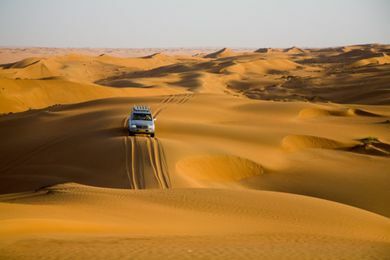 Several people have tried to cross stretches of the Omani desert on their own in a rented 4WD. Some of these people have died or got rescued just in time. Travelling through a desert requires proper preparation. It looks easy from a modern air-conditioned 4WD, but if that fails you are suddenly back to basics. Never go off-road alone. A minimum of two to three cars (of the same make) is the rule. Leave your itinerary with a friend with clear instructions if you do not return in time. Take at least: - recovery tools: spades, rope (and attachments), sand mats or ladders - two spare tires and all required equipment - a good air pump (high capacity) - sufficient water (at least 25 litres more than you think you will need for drinking) - sufficient petrol: there are no petrol stations in middle of nowhere. If you have – or can get – a satellite phone, take it. (Mobiles work only in limited areas.) Check your car before embarking on such a trip. The Omanis are generally very humble and down-to-earth people. The usual rules of respect when travelling in a Muslim country should be followed in Oman, even when locals appear to be a little less uptight than their neighbours. Stay quiet about the sultan, who has done more to develop the nation in recent history. He is expected to be held in extreme respect. Staring is quite common in Oman. Children, men and women are likely to stare at you simply for being a foreigner, especially if you travel off-season and in out-of-the-way places. This is not meant as an insult but shows an interest, and a friendly smile will leave the kids giggling and showing off and the adults happily trying out their few English phrases. Outside of Muscat and Salalah, do not smile at the opposite gender, as nearly any interaction with the opposite gender can be considered flirting. The highly segregated society makes any chance people have to speak to the opposite gender to be viewed as having at least semi-sexual overtones. It must be understood that under Omani law, an Omani can take or be taken to court for insulting another person, like calling them an insulting name ("donkey", "dog", "pig", "sheep" etc.). Omanis, though "humble" are extremely sensitive to anything they perceive as criticism, whether personal, national, or anything they perceive as being directed at the Gulf. Though Saudi Arabia is usually a fair target for jokes in the Arab world (especially in the Levant), Omanis don't take well to it. What Westerners would usually consider "ridiculous" levels of sensitivity, are fairly normal in Oman and are due largely to the fact that Omanis have grown up in an environment in which criticism and name calling is more or less outlawed. This is especially important to know for those who come here to teach Omanis - unlike those from the Levant and parts of north Africa, where teasing and intellectual "jousting" can be used as a form of building relationships or a sign of friendship, it is not here and Omanis do not interpret it positively, save for those who have lived in the West or have worked with Westerners for extended periods of time. It might be said that teasing in general here, whether about accents, dress, food, etc. is just a bad idea. The country code for Oman is 968. These 8-digit numbers generally start with a 9 if it is amobile number, and with 2 for land lines, though other numbers will eventually start to get used. 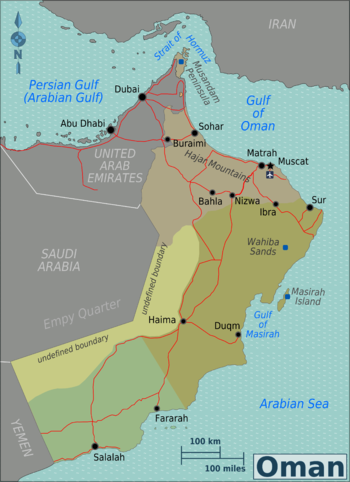 This article contains content from Wikipedia's Oman article. View that page's revision history for the list of authors. This page was last edited on 21 April 2019, at 01:57.